If you have ever been a hijabi, or are one at present, or have been since you can remember, there must be lots of hijab-related incidents which you can recall. Some make you chuckle, others make you cringe and some leave you just baffled, maybe even a little upset. Whatever the scenario, the fact remains that the way we hijabis feel about our hijab is most certainly not how others might view it. I, being a hijabi myself, can relate to many sisters who have experienced at times being judged for it, and at times being a motivation for it. When I wore the hijab, being a modern and outgoing lady (which I apparently used to be … wait, hang on … I still am!! ), in the opinion of some, a halo should have appeared above my head! So I sat down with a friend – progressive, well spoken, well dressed, career-woman (doctor to be precise), mother of two, ardent reader, flawless writer, a fan of English movies and yes, a HIJABI – and we jotted down some FAQs and some NAAHSQs. In case you are wondering, the latter stands for Never Ask a Hijabi Such Questions. Sit back and relax, because I present to you some of those NAAHSQs, along with what we secretly imagine ourselves saying in return, if we didn’t have to worry about being polite. Do you ever take the Hijab off, or do you wear it all the time? Since you asked, yeah we keep it on all the time. In the shower, while sleeping, we even shampoo on top of it, and only remove it when it starts to smell or rip! Okay, jokes apart, we only wear it where we need to i.e. in the presence of men we can marry. No, of course not! That is just dew forming on top of my foundation. I actually have built-in air-conditioning in there. Of course we feel hot at times. But don’t you anyway living in a hot country? That’s an interesting one. As a matter of fact we do. Our lovely scarves protect our hair from damaging sunrays, pollution and harmful chemicals found in hair dyes as we can get away with not dying hair as frequently. It’s so cool that you never have to worry about a bad hair day! Oh yeah that is a perk. Well, it’s so cool that YOU never have to worry about a bad hijab day, when it doesn’t sit right, or doesn’t match the outfit! Well, never, of course! Kidding – as often as, or maybe even more often than, anyone else. Can you hear alright under all the covering? Well, it does filter out a lot of rubbish. We are much better at sign language (pun intended) and smiling. Are you allowed to have a haircut? How do you get a haircut? We get the hairdresser to put her scissors inside the scarf, and snip. Oh, and we put a blindfold on him/her first. Yes, we do get haircuts as glamorous as anyone else, and, yes, we do let our hair down and have it done up for parties where we are comfortable removing the hijab. 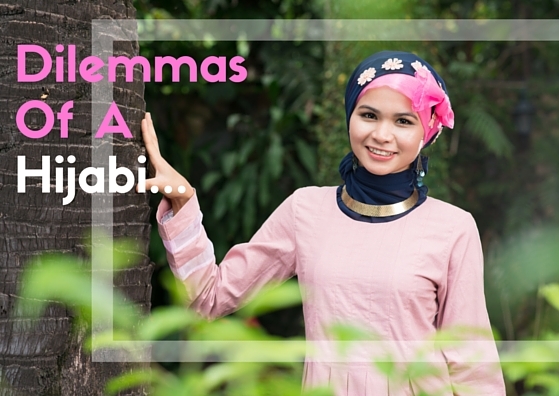 What are the etiquettes to follow if a hijabi removes her scarf at a gathering? What a good question! Please take care while taking pictures, getting her consent to be part of them, or politely ask her to wear her scarf before the picture is taken. If you do accidentally catch a picture of her without her hijab, please do not share that picture where others can view it e.g Facebook and Whatsapp etc. Please do not “tsk” or give tongue-in-cheek expressions because you thought I was cool at the party but went all hijabi when leaving. On a related note, some of us may not feel comfortable removing our headscarf even in an all-female gathering for a number of reasons, so if we refuse upon your suggestion to, please do not be offended. Why do you wear it? Is it a requirement? Religiously speaking, yes! Like the nuns wear their habit, or orthodox Jews cover themselves, we Muslim women are commanded to be modest and to be identifiable as Muslim women. That being said, how some wear it and some do not, is a personal choice, like in any faith, where people practice to different extents. Errrrm … kind of! Most of us do not start wearing it with an intention to stop. On a more serious note, we only mind questions when their answers are obvious, or when they are asked in an offensive manner. We appreciate it when you ask out of genuine curiosity, because we would rather you ask than make incorrect assumptions. We can definitely hold a conversation about our hijab, and would be happy to, as long as you remain open-minded, as will we.